My friend Zim once nicknamed me Nerderella and I will freely admit to being a bit of a geek. I think I’m more of an aspirational geek than a real born-to-geek type though. I put a lot of this down to the fact that I was so rubbish at Science at school. When I went to school science was split into three subjects…Biology, Chemistry and Physics and I didn’t understand any of them. I’d play up at the back at the class. I lost count of the amount of detentions I got for messing with the bunsen burners instead of paying attention to the teacher. The problem for me was that you had to take at least one science subject throughout your school life but also, luckily for me, they split Biology out into 3 subjects one of which was called ‘Social Biology’. That was my bag. It was designed for people that wanted to go into teaching or caring professions or for those that wanted to go on to study psychology or sociology after school. Thank god for that subject or I don’t think I’d have any science based qualifications at all. Yesterday saw the opening of the Geeks n Nerds Fair which runs until the 1st November. Now, I’m from the UK and our schools never had these kind of science fairs but I grew up watching American films and these were often mentioned. So, I was kinda in awe of these two items from unKindness for the Geeks n Nerds Fair. 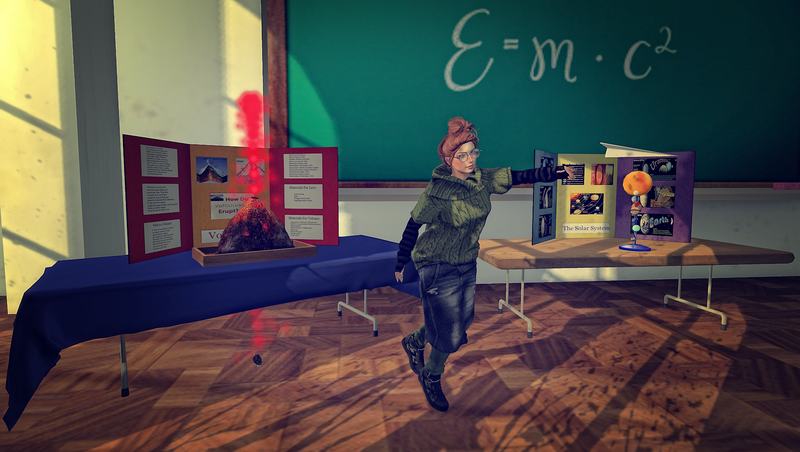 The Volcano Science Fair Project comes with an exploding particle effect and lots of very important information for the average geek about Volcanoes. The other item in the set is a Solar System Science Project.